Even though she had a bachelor’s degree in business administration, Hope Shwom did not go looking for a job with financial services firms or booming biotech companies in the Boston area. Instead, the recent graduate of the University of Massachusetts Boston looked for work helping her people. Then her Mashpee Wampanoag Tribe hired Shwom, 26, as assistant director of its education programs. She is now community planner for the Mashpee Wampanoag Tribe of Cape Cod. Shwom received some assistance financing her education, first at Cape Cod Community College and then at the university, through a Massachusetts program that provides tuition waivers to Native Americans who live in the state. Michigan and Maine also have similar programs. The tuition waivers started decades ago and, in the case of Michigan, survived a state referendum banning affirmative action in 2006 because being a member of a Native American tribe is not considered a racial designation, but rather a political status—citizenship in another sovereign nation. State coordinators of the waiver programs say that they have increased college-going by Native Americans and produced leaders who return to their tribes, as Shwom has done. Waivers granted by the University of Maine system have had an outsized impact on the governments of the state’s four tribes, says John Bear Mitchell, who directs that program. Despite their similarities in purpose and impact, the state programs vary in terms of eligibility and the relative value of the tuition breaks. The Massachusetts program is comparatively broad. The waivers are available at any public college and university in the state to enrolled members of tribes recognized by the federal, state or Canadian governments. Also eligible are residents whose parent or grandparent was a tribal member. The state Commission on Indian Affairs recognizes 11 tribes and bands, all connected with three major tribes—the Wampanoags, Nipmucs and Ponkapoags. According to the 2010 Census, about 51,000 state residents claimed some Native ancestry. A smaller number were enrolled members of a tribe. Stanley says that about 120 students use the tuition waivers each year, with the largest number being Mashpee Wampanoags, followed by Nipmucs. The University of Massachusetts Dartmouth and Cape Cod Community College are the most popular schools because they are located near where many Mashpee live, she says. The waivers, though, are worth relatively less than those in Michigan and Maine because of an odd situation in Massachusetts: fees to attend public colleges far outstrip the tuition they charge. At the University of Massachusetts Boston, for example, annual fees for a full-time undergraduate are more than five times higher than tuition, about $11,000 versus nearly $1,800. The imbalance developed over the years because the state Legislature and the colleges found it politically popular to keep tuition low, but state spending for higher education declined, causing colleges to compensate by repeatedly raising the fees that students have to pay. The balance between tuition and fees was reversed when a state law authorizing the waivers was passed in 1981. “Years ago, the tuition was higher than the fees,” notes Stanley, who is of Pequot/Mohegan ancestry. In contrast, Michigan has tighter eligibility criteria but its waivers are worth far more. Eligible students have to be a resident of Michigan for a year, an enrolled member of a federally recognized tribe and be at least one-quarter Native American. According to Kiesewetter, a state law created the waivers in 1976. Kiesewetter says that the referendum Michigan voters approved in 2006 banning affirmative action in public agencies eliminated the eligibility of members of tribes recognized by states or Canada. “We had a significant decrease for a significant population that was no longer able to receive the tuition waiver,” Kiesewetter says. But the Native American waivers survived, despite the ban. Michigan has a dozen federally recognized tribes, which are related to three major ones—the Odawa, Chippewa and Potawatomi. In the last census, approximately 139,000 Michigan residents identified themselves as having Native ancestry, regardless of whether they were enrolled tribal members. Kiesewetter says that she has approved an average of 1,000 applicants for waivers each of the last five years, with the largest numbers coming from the Sault Ste. Marie Tribe of Chippewa Indians and Little Traverse Bay Bands of Odawa Indians. The popular universities, because of their proximity to reservations and cultural support for Native students, are Michigan State, Northern Michigan, Central Michigan and Lake Superior State universities, she says. The waivers cover the bulk of the cost—the tuition—other than room and board and fees at those schools. The Native American waivers at the seven campuses of the University of Maine are worth relatively even more, because they cover tuition as well as fees. Eligible students can also receive a grant for room and board, based on financial need, Mitchell says. The waivers are available to residents who are enrolled in a tribe recognized by federal, state or Canadian governments, criteria the same as in Massachusetts but broader than Michigan’s. Mitchell says that a student is also eligible if a parent or grandparent has been enrolled in one of the four Maine tribes: the Penobscot, Passamaquoddy, Micmac and Maliseet. In 2010, a little more than 18,000 Maine residents claimed Native ancestry in the census, though all were not enrolled in a tribe. The University of Maine System Board of Trustees created the waivers in 1934 for four students from the Penobscot and Passamaquoddy to fulfill its mission to serve local populations as a land-grant institution, Mitchell says. The program was gradually expanded in later decades. Unlike in Michigan and Massachusetts, it is not based on state legislation, but the board’s policy. Mitchell says that 543 students from 22 tribes currently use the waivers. Most are Penobscot, whose reservation is near the flagship campus in Orono. 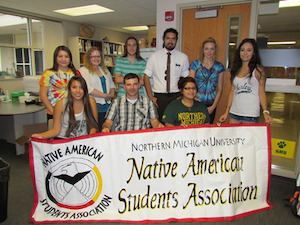 It enrolls 197 Native students on waivers. Besides coordinating the waiver program, Mitchell, who is Penobscot, says he has benefited from it.